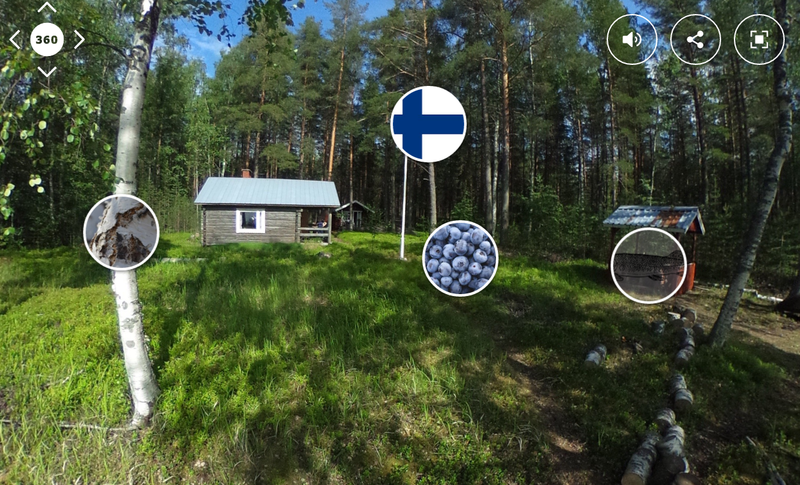 The next activity in the ThingLink Summer VR Challenge is to create a travel guide as a model for a project that encourages students to construct knowledge as they create. Explore the image above for a simple example, created using a CC licensed image found in the equirectangular group of Flicker. The first step is to locate an interesting image of a location you would like to learn about. Here are some places to find a properly licensed image for modification and reuse. From your own 360 capable camera. From an app on your phone or tablet. From a suggestion added to the Padlet below from a helpful 360/VR Pioneer. All contributions and ideas are welcome. We are all learning together! To upload an equirectangular 360 image to ThingLink, it must have an aspect ratio of 2:1. This means your image must be twice as wide in width as it is in height. Many images you find will have the correct aspect ratio, but you can all resize an image on your Mac or PC. On a Mac, open the image in Preview and in the Tools menu select Adjust Size to alter. On a PC, open the image in MS Paint and use the Resize button to adjust the size in pixels. The maximum resolution ThingLink accepts is 5376 x 2688. If an image goes beyond that it will need to be downsized a bit. Click on the bottom blue button to start the upload process. After the upload is completed, the 360 image will open in editing mode. Note: If your image does not fit the size requirements, you will receive a message with size requirements. At this point you need to resize the image, see directions above. 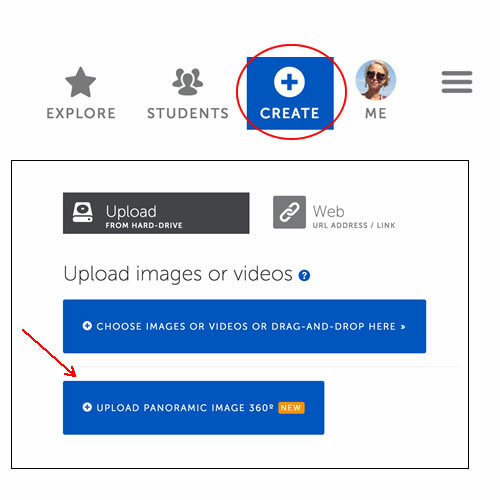 Once you have successfully uploaed an image to ThingLink, it’s time to think about the possibilities that exist for engaging students in constructing knowledge as they create. A travel guide is a traditional classroom project that can be maximized through the use of 360/VR because students can explore the image to prompt research and annotate it to demonstrate learning. The best way to understand this is for teacher challenge participants to try it themselves. View your 360 image in full screen to explore it. Look around to generate questions about the location. Here are some starters in case you are stuck. Where can this location be found on the map? What types of animals live here? What types of plants live there? What are the highlights of visiting this location? Is there a water source? Generate questions and find answers. Allow students to search by text or by images. Did you know that nonreaders can take a snapshot of the image and upload it through Google image search? Add the information to tags with text, media, images, audio or include any 3rd party tool with an embed code. Add tags to display the CC license. Include the name of the photographer with a link back to the image source. Add a tag to credit yourself as the source of the modifications. Consider adding tags to list standards addressed. Add a title and please consider adding background audio to your lesson. To do this, click the Settings button below the image when in editing mode. You will see where to add a title and upload audio. All Teacher Challenge activities are collected through an In Box. This inbox is embedded below and also available in the sidebar of this blog. If you have a camera or app capable of taking 360 images, please join Kathy’s group to contribute your properly licensed photos for reuse for education. You may also use any of the images submitted by educators, but we hope you will explore ways to create your own images and contribute them to the group as well. Kathy has a treasure trove of expertise and advice and the group is clearly organized to help educators embrace 360 photography so please spend some time on Kathy’s site. This group has 17.9 equirectangular images that have been resized with the correct ration of 2:1. This means these images are sized correctly and ready for uploading. Please explore this page when searching for images. Activity 1: Get Started with the ThingLink Summer VR Challenge: Tag it! Our ThingLink Summer VR Challenge is in full-swing and we are extremely excited about introducing our participants and sharing the vocabulary lessons that have been created! We hope you will explore the map at the top of this post to meet the Digital Selves of the talented participants leading the way through this self-paced challenge. The map will be updated again to include more participants as they make it through the activity. 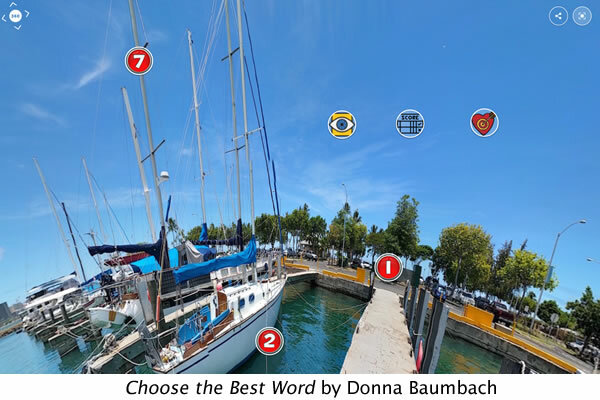 Our collection of engaging vocabulary activities is growing as participants complete the lesson, Vocabulary Across All Languages for the Summer VR Challenge. Please explore this poster, highlighting the most recent lessons submitted to the challenge. As participants submit lessons, they are added to a poster. The posters are assembled into a slideshow channel of resources. This resource will continue to grow as the Summer Challenge progresses. We hope you will keep an eye on this channel and watch it grow! As a follow up to my Simple K-12 webinar, I’m publishing the interactive slideshow used to guide the learning. Please explore these sides and tap on the tags to learn more about the slides. We are extremely pleased to share the first round of interactive 360/VR vocabulary lessons created by amazing educators participating in the ThingLink Summer VR Challenge. These 360/VR pioneers have created highly engaging lessons filled with annotations that guide the learning and provide students with flexible learning paths to ensure success for all learners. They offer opportunities to collect data to personalize instruction and they model good digital citizenship through the use of proper source crediting of images licensed for reuse. Click on any of the lessons on this interactive image poster to explore it. Remember to select full-screen mode in the upper right corner for the best viewing experience. These lessons were created for Activity 2: Vocabulary Across All Languages. You can access the full set of directions on the ThingLink Blog for Education. If you are already a pro at using ThingLink 360/VR, you can take a shortcut and review important criteria for completion by clicking on the Teacher Challenge InBox. I’m excited to be facilitating a Simple K-12 webinar designed to help educators learn to Create an Interactive Map Project. This is part of a full-day of webinars dedicated to introducing Tools for Student Projects. I hope you can join us on Tuesday, July 19th. 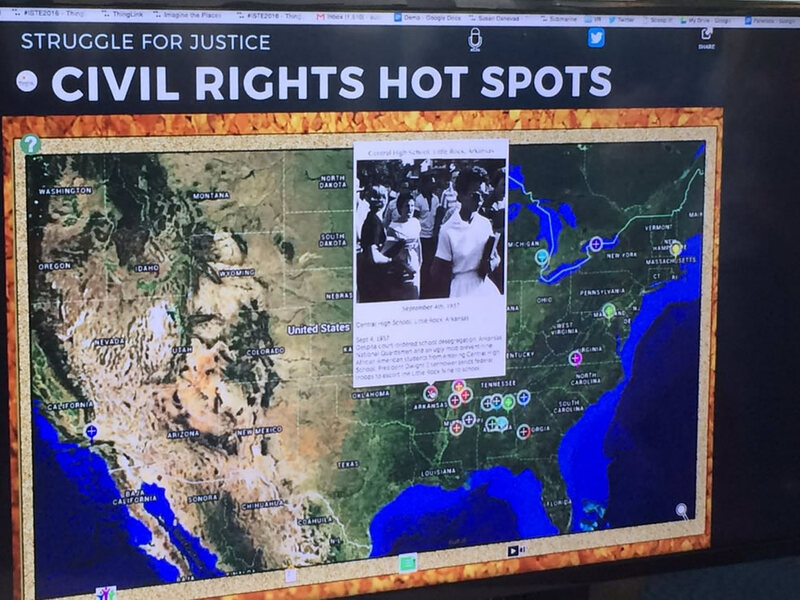 My session will explore the interactive map project you see below, Struggle for Justice. Participants will learn how to use Google Add-Ons to quickly create a map, then they will learn to bring the map to life by adding rich media tags with details about the events, marked by hot spots on the map. Imagine the powerful possibilities of using an interactive map to launch a class project! Here is an interactive slideshow used to guide the learning during this recent webinar. Simple K-12 members can view the recorded version on SimpleK-12.com. Come discover how you and your students can create interactive maps that will encourage student exploration, invite curiosity and promote spatial thinking. Join Susan Oxnevad as she shares how you can create and use these interactive map projects for a variety of grade levels and subjects. She will explain how these maps can be used to provide students with background knowledge to launch a unit, or as a starting point for digging deeper into any concept through research. Susan will also show how to publish and share completed student projects on top of an interactive map to help provide a big-picture overview of the learning going on in your classroom. Come get inspired to create interactive map projects and learn how useful they can be in teaching a variety of topics, across grade levels and content areas. Every ThingLink starts with an image. This week’s ThingLink Summer VR Challenge activity will help educators learn how to create a simple, yet powerful vocabulary lesson that starts with a 360 image. You will add tags to the image to introduce students to new words and concepts and build vocabulary. One of the greatest benefits of using ThingLink EDU as a tool for learning is the ability to easily build in data collection for assessment, planning, and personalized learning. Participants in the Summer VR Challenge will discover Google Forms woven throughout the lessons. Look for the icons to access these forms on the 360 World Map as you work your way through Lesson 1: Get Started with the ThingLink Summer VR Challenge. Data Collection: Complete the checklist to self-assess your learning and provide feedback used for planning and reteaching. FAQs: Questions submitted will be answered and published on a Google Doc that has been embedded into the 360 World Map. This doc will be ongoing throughout the challenge. ThingLink Summer VR Challenge: Tag it! Welcome to the ThingLink Summer VR Challenge! The first lesson is designed to help all participants learn to explore and create while you engage in constructive play. You will also begin to connect with others by Designing Your Digital Self with ThingLink. Those interactive images will be added to the 360 map you see at the top of the page. Let’s begin! 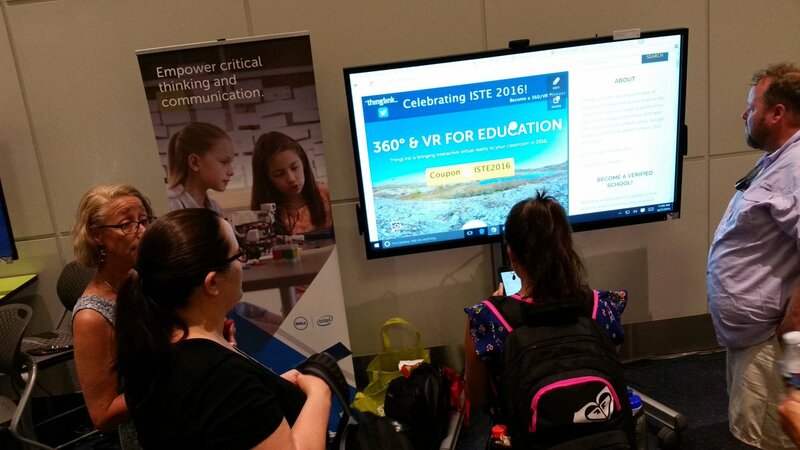 ThingLink made a big splash at ISTE2016 with interactive 360/VR lessons. Educators were excited to discover the powerful possibilities of using the sleek new tool to design learning experiences on top of breathtaking 360 images. Many thanks to Naomi Harm and Dell for inviting us to display our images on the gorgeous, new 70 inch LED touch display! Everyone loved exploring the 360/VR lesson on London, above. Explore the lesson in full-screen mode for the best experience. Find a link to participate in the ThingLink Summer VR Challenge, a self-paced and free pilot with pedagogy. Sign up to gain access to the 360/VR Tag Editing tool and learn to create and share interactive 360/VR images. Find the coupon ISTE2016 to become a 360/VR Pioneer and lock in pioneer pricing, for life. Get the 360/VR tag editing tool plus all of the premium features of ThingLink for $100 per year for life. Take advantage of this ISTE2016 coupon today. At ISTE2016 I had the opportunity to hold my first hands-on training session using ThingLink 360/VR. The room was filled with educators using a variety of devices. I’m happy to report that participants were able to work in teams to add tags to 360/VR images easily with very simple, basic directions. They were able to generate ideas for using ThingLink to meet their teaching and learning needs. It is an honor to empower educators with tools that help them transform teaching and learning, and ThingLink 360/VR is a tool that can do that! Many educators at ISTE2016 stopped by the EdTech Coaches Playground to chat with Jodie Johnston and I about the ThingLink Summer VR Challenge. Jodie and I met during the 1st ThingLink Summer Challenge 3 years ago, and it was such fun meeting face-to-face and working together to invite educators to join us this year! Teachers who recently registered for the summer VR Challenge are being given access to the 360/VR tag editing tool and the teacher challenge is about to begin!